1Instituto de Investigaciones Agropecuarias, INIA Carillanca, km 10 camino Cajón-Vilcún s/n, Temuco, Chile. 2Universidad de Talca, Facultad de Ciencias Agrarias, Av. Lircay s/n, Talca, Chile. *Corresponding author (sortega@utalca.cl). 3Universidad de Chile, Facultad de Ciencias Agronómicas, Santa Rosa, 11315, Santiago, Chile. The use of actual evapotranspiration (ETα) models requires an appropriate parameterization of the available energy, where the net radiation (Rn) is the most important component. Thus, a study was carried out to calibrate and evaluate three semi-empirical approaches to estimate net radiation (Rn) over a drip-irrigated olive (Olea europaea L. 'Arbequina') orchard during 2009/2010 and 2010/2011 seasons. The orchard was planted in 2005 at high density in the Pencahue Valley, Maule Region, Chile. The evaluated models were calculated using the balance between long and short wave radiation. To achieve this objective it was assumed that Ts = Tα for Model 1, Ts = Tv for Model 2 and Ts = Tr for Model 3 (Ts is surface temperature; Tα is air temperature; and Tv is temperature inside of the tree canopy; Tr is radiometric temperature). For the three models, the Brutsaert's empirical coefficient (Φ) was calibrated using incoming long wave radiation equation with the database of 2009/2010 season. Thus, the calibration indicated that Φ was equal to 1.75. Using the database from 2010/2011 season, the validation indicated that the three models were able to predict the Rn at a 30-min interval with errors lower than 6%, root mean square error (RMSE) between 26 and 39 W m-2 and mean absolute error (MAE) between 20 and 31 W m-2. 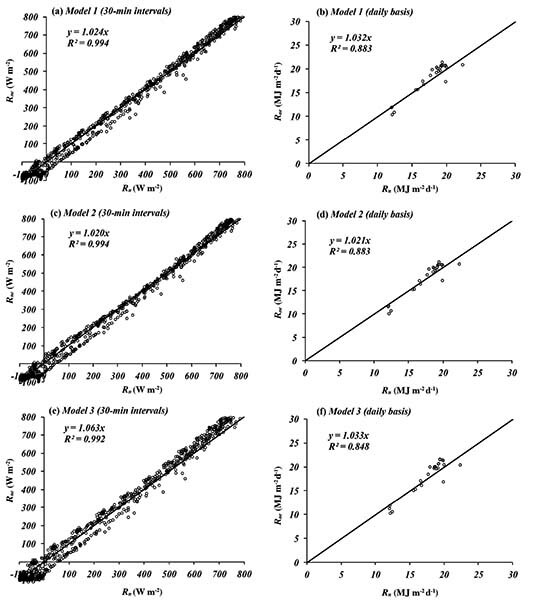 On daily time intervals, validation indicated that models presented errors, RMSE and MAE between 2% and 3%, 1.22-1.54 and 1.04-1.35 MJ m-2 d-1, respectively. The three R„-Models would be evaluated and used in others Mediterranean conditions according to the availability of data to estimate net radiation over a drip-irrigated olive orchard planted at high density. Key words: Actual evapotranspiration, air emissivity, Brutsaert's equation training system, Olea europaea. A better irrigation water management for optimizing water efficiency of cultivated plants is required due to irrigation water scarcity. Thus, the accurate determination of actual evapotranspiration (ETa) is a key factor to compute the optimum water requirements. In this context, ETα is calculated using a reference evapotranspiration (ET0) from a grass or alfalfa-surface multiplied by specific crop-coefficients (Kc). Furthermore, several researchers have suggested using three or two-source models to directly compute ETα. These models are based on the Penman-Monteith approach to compute separately plant transpiration from soil evaporation (Shuttleworth and Wallace, 1985; Brenner and Incoll, 1997; Testi et al., 2006; Ortega-Farías and López-Olivari, 2012). The use of ETα models requires an appropriate parameterization of the available energy, where the net radiation (Rn) is the most important factor. In general, the Rn has been estimated using empirical models or linear regressions, which use the incident solar radiation as the main input variable (Kustas et al., 1994; Al-Riahi et al., 2003; Alados et al., 2003; Almeida and Landsberg, 2003). Pereira et al. (2007) used a simple approach to transform daily values of grass Rn into whole tree canopy net radiation for walnut, apples, olives, and citrus. However, these models are site-specific and do not consider the long wave components in the calculation of Rn. On the other hand, there are semi-empirical models based on Stefan-Boltzmann law that includes the estimation of long wave radiation into the Rn formulation. The accuracy of these models depends mainly on the atmospheric emissivity (εα) for which there are several ways of calculations in literature (Bastiaanssen, 1995; Prata, 1996; Crawford and Duchon, 1999), but many of they are empirical and generally site-specific. Among the semi-empirical algorithms to calculate εα, we can highlight the Brutsaert's equation, which is based on radiative transfer theory. For agricultural applications, the Brutsaert's emissivity equation has been widely used to compute Rn for several crops such as green grass, maize, pecan, and cottonwood trees and grapevines (Allen et al., 1998; Ortega-Farías et al., 2000; Samani et al., 2007; Carrasco and Ortega-Farías, 2008; Irmak et al., 2010). Recently, Ezzahar et al. (2007) used the original Brutsaert's equation to estimate long-wave radiation for an irrigated olive orchard. In this study, the authors used as input the surface temperature computed as a function of soil and canopy temperatures, and fractional cover. Furthermore, Berni et al. (2009) used the same equation incorporating the cloud fraction term (clf) to correct the emissivity on clear conditions for a drip-irrigated olive orchard. The empirical coefficient (Φ) of the Brutsaert's equation depends on variations of climate characteristics, thus a local calibration of Φ is required to improve the calculation of Rn (Sugita and Brutsaert, 1993). In literature there are few semi-empirical methods to estimate Rn over fruit trees especially for olive orchard planted at high density (> 1300 trees ha-1). In this regard, the objective of this research was to evaluate three semi-empirical models to estimate net radiation (Rn) over a drip-irrigated olive orchard planted at high density. where, εα is air va por pressure (kPa) and Φ is empirical coefficient. The experiment was conducted during the 2009/2010 and 2010/2011 growing seasons on a drip-irrigated olive orchard (Olea europaea L. 'Arbequina') for oil production. The orchard had an extension of 2.7 ha with a slope of 1.6% and is located in the Pencahue Valley (35°23' S, 71°44' W; 96 m a.s.l. ), Maule Region, Chile. The olive trees were planted in 2005 in East-West orientated rows. Trees were planted 5 m apart with 1.5 m within-row (1333 trees ha-1) and conducted in cone trellis system at a height of 3.2 m and canopy width of 1.55 m. The climate in this area is a typical Mediterranean semiarid climate with a daily average temperature of 14.8 °C between September and May. Average annual rainfall in the region reaches 602 mm mainly concentrated during the winter months (June-September). The summer period is usually dry (3.5% of annual rainfall) and hot with high atmospheric demand for water vapor. The soil is classified as Vertisol (Family Fine, thermic Xeric Apiaquerts, Quepo series) with a clay loam texture (CIREN, 1997). An automatic weather station was installed to measure meteorological variables over a drip-irrigated olive orchard planted at high density. Wind speed (u) and wind direction (w) were monitored by a cup anemometer and a wind vane (03101-5, R.M. Young Company, Traverse City, Michigan, USA), respectively. Precipitation (Pp) was measured by a rain gauge (A730RAIN, Adcon Telemetry, Klosterneuburg, Austria). Air temperature (Ta) and air relative humidity (RHa) were measured using HOBO Pro RH/Temp sensors (Onset Computer, Bourne, Massachusetts, USA). Net radiation (Rn), incoming (R↓) and outgoing (R↑) solar radiation were measured by a four-way net radiometer (CNR1, Kipp & Zonen, Delft, The Netherlands) installed at 1.9 m above the tree canopy. In this radiometer, the short and long wave solar radiations are measured by two CM3 pyranometers and two CG3 pyrgeometers, respectively. Half-hour averages of all balance radiation signals were recorded on an electronic datalogger (CR5000, Campbell Scientific, Logan, Utah, USA). Sensors of u, w, Pp, Tα, and RHα were installed at 4.8 m above the soil surface. Also, a HOBO sensor to measure canopy temperature (Tcv) and relative humidity (RHcv) was installed inside the canopy at 1.5 m above the soil surface. Finally, a hand-held multi-spectral radiometer equipped with sun angle cosine correction capacity (MSR16R, CropScan Inc., Rochester, Minnesota, USA) was used to estimate the Normalized Difference Vegetation Index (NDVI) over the canopy and soil surface between rows. The measures of multi-spectral radiometer were recorded once a week. The multi-spectral radiometer was manually transported and a support pole was used to position the radiometer 0.5 m above the tree canopy. Irrigation water was delivered four times per week using 2.1 L h-1 drippers spaced at 0.75 m intervals along the rows (two drippers per plant). Olive tree water status was evaluated, every 15 d, using midday stem water potential (%) measured with a pressure chamber (model 1000, PMS Instrument Co., Albany, Oregon, USA) on 30 shoots (one shoot per tree) covered for 2 h before measurement with a plastic bag and aluminum foil. Olive trees were maintained under non-water-stress conditions (ψx > -1.5 MPa) during both studied seasons (Moriana et al., 2007; Gdmez-del-Campo et al., 2008). The fractional cover (fc) of the olive orchard was calculated according to Er-Raki et al. (2008) methodology obtaining values of 0.29 (± 0.07) and 0.30 (± 0.05) for the 2009/2010 and 2010/2011 seasons, respectively. Two averaging thermocouples probes (TCAV, Campbell Scientific) were used to measure soil temperature (Tsoll) installed at 0.02 and 0.06 m depth (two pairs in the inter row and two pairs below the row). Averages of 30-min for all thermocouples probes were recorded using an electronic datalogger (CR3000, Campbell Scientific). where Tsoil and Tcv are soil and canopy temperatures (K), respectively; fc is the fractional cover of the olive orchard (0.29 and 0.30 during 2009/2010 and 2010/2011 seasons, respectively) and C is the empirical coefficient (C = 0.85). where NDVIbr is the normalized difference vegetation index measured from soil between rows (dimensionless); NDVIr is the normalized vegetation index measured above olive canopy (dimensionless); n is the number of total measurements and m is the individual measurement. where Ei and Oi are the estimated and observed values, respectively; O is the mean of the observed values and n is the total number of observations; n - 1 is the degree of freedom; MBE is the mean bias error. Additionally, the Z-test was used to check whether the value of reo was significantly different from 1.0 at the 95% confidence level. Daily mean values of incoming short wave radiation (R?) were between 2.4-33.9 and 4.5-34.2 MJ m-2 d-1 for the 2009/2010 and 2010/2011 season, respectively. Daily mean values of measured net radiation (Rn) ranged between 0.2-21.9 MJ m-2 d-1 for 2009/2010 season and 3.5-21.8 MJ m-2 d-1 for 2010/2011 season (Figure 1a and 1d). The ratio of Rn to R↓was about 0.46 and 0.62 during the first and second seasons, respectively. The average (Taavg), maximum (Tamax) and minimum (Tamin) air temperatures throughout 2009/2010 season were 17.9, 27.9, and 9.1 °C, respectively (Figure 1b). Temperatures during 2010/2011 season were of 19.4, 29.2, and 10.4 °C for Taavg, Tamax, and Tamax, respectively (Figure 1e). The values of minimum air temperature during the period of measurements throughout 2009/2010 and 2010/2011 seasons were of 6.2 and 4.1 °C, respectively, while those of maximum air temperature during 2009/2010 and 2010/2011 seasons were 35.7 and 38.3°C, respectively. For the 2009/2010 season, mean values of Davg, Dmax, and Dmn were 1.1, 2.8 and 0.11 kPa, respectively (Figure 1c), while those observed during 2010/2011 season were of 1.2, 3.0 and 0.10 kPa, respectively (Figure 1f). Figure 1. Daily values of incoming short wave radiation (R↓) and net radiation (Rn) [(a) and (d)]; air temperature (Ta) [(b) and (e)]; and vapor pressure deficit (D) [(c) and (f)] during the 2009/2010 and 2010/2011 seasons, respectively. Taavg,, Tamax and Tamin are average, maximum, and minimum air temperature, respectively; Davg, Dmax and Dmin are average, maximum, and minimum vapor pressure deficit, respectively; DOY is the day of year. For the 2009/2010 database, the Brutsaert's coefficient was of Φ = 1.75 for all three models using a non­linear optimization. In this case, the Rl↓ values were underestimated by about 1% and 30% for Φ equal to 1.75 and 1.24, respectively. Also, RMSE and MAE values were 22 and 17 W m-2 for Φ = 1.75 while those were 101 and 98 W m-2 for 0 = 1.24, respectively (Table 1). For F = 1.75, the t-statistic was 1.82 and the Rel↓/Rl↓ ratio (reol) and refined index of agreement (dr) were more close to 1, with values of 0.99 and 0.66, respectively. However, for F = 1.24, the t-statistic, reol, and dr indexes were 164.29, 0.70, and 0.50, respectively (Table 1). Crawford and Duchon (1999) suggested seasonal adjustments to the F coefficient ranging from 1.28 in January to 1.16 in July (North Hemisphere). Sridhar and Elliott (2002) for Oklahoma and Culf and Gash (1993) for Niger found a mean value of 1.31 to four different geographic and climatic conditions. However, Sugita and Brutsaert (1993) suggested a new empirical coefficient of 0.98 using data from the First International Satellite Land Surface Climatology Project (ISLSCP) Field Experiment (FIFE). In this regard, Sugita and Brutsaert (1993) proposed to locally calibrate the Brutsaert's formula in order to accurately estimate the incoming long wave radiation for specific agroclimatic conditions. Sicart et al. (2010) indicated that the F values depend directly on local atmospheric conditions where changes in temperature and humidity certainly are the main factors. Table 1. 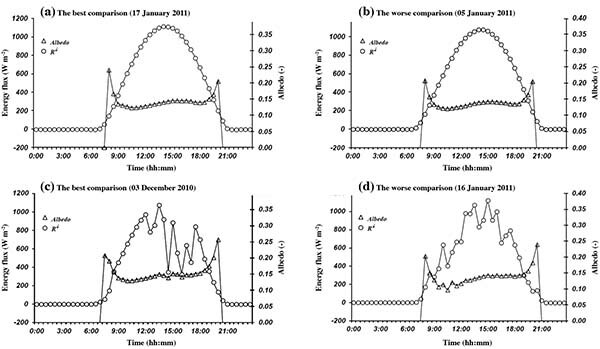 Statistical evaluation for three semi-empirical models to estimate incoming long wave radiation (Rl↓) and net radiation (Rn) over a drip-irrigated olive orchard planted at high density during the 2009/2010 season. reol: ratio of estimated (Rel↓) to observed (Rl↓) values of incoming long wave radiation on 30 min; T: true hypothesis (b = 1); F: false hypothesis (b ≠ 1). 1The smaller the value of t, the better is the model's performance. For the 2009/2010 database, the comparison between measured and computed Rn indicated that Models 1, 2, and 3 using Φ = 1.75 presented errors between 4% and 5%, whereas those using Φ = 1.24 had errors between 10% and 11%. In this regard, Brotzge and Deuchon (2000) and Brotzge and Crawford (2003) reported that the possible errors in the estimation of Rn for cloudy days could be associated with the parameterization of the air emissivity. Furthermore, Ezzahar et al. (2007) and Ortega-Farías et al. (2000) showed that the use of the uncalibrated Brutsaert's formula that might create an important scattering for low Rn values. For all-sky condition, the major difficulty was associated with the estimation of the long wave radiation, which it is related to the surface temperature (Ts). The mean albedo value (a) obtained using measurements of R↑/R↓ratios from 09:00 to 18:00 h (Figure 2) indicates that the albedo was relatively stable and ranged between 0.15-0.18 for clear and cloudy day. Thus, a mean albedo equals to 0.17 (± 0.015) was used for the models evaluation using the 2010/2011 database. A similar albedo (α = 0.17) was observed by Cammalleri et al. (2010) for an olive orchard with a canopy height and fractional cover equal to 3.7 m and 0.35, respectively. Figure 2. Daytime variation of the best (a and c) and worse (b and d) comparison of the incoming short wave radiation (R↓) and albedo for the representative clear days during 2009/2010 and 2010/2011 seasons. A good agreement was obtained between measured (Rn) and estimated (Rne) values of net radiation for the three models during the 2010/2011 database (Table 2). Using data at 30 min time interval, the model evaluation indicated that RMSE was between 26 and 39 W m-2 and MAE was between 21 and 31 W m-2 for the three models. The Model 2 and 3 presented the lowest value of t-statistic compared to Model 1. The Z-test showed that reo was significantly different from unity suggesting that the three models tended to overestimated Rn with an error lower than 6% (Table 2). For the daily comparison, Table 2 indicates that the Model 3 presented the highest values of RMSE (1.54 MJ m-2 d-1) and MAE (1.35 MJ m-2 d-1). Furthermore, the Z-test shows that reo was significantly different from unity indicating that the Models 1, 2, and 3 overestimated Rn with errors lower than 3% (Table 2). Finally, the refined index of agreement (dr) on daily basis was close to 1.0 while those on 30 min time interval ranged between 0.95 and 0.97. Table 2. Daytime variation of the best (a and c) and worse (b and d) comparison of the incoming short wave radiation (Rn) and albedo for the representative clear days during 2009/2010 and 2010/2011 seasons. 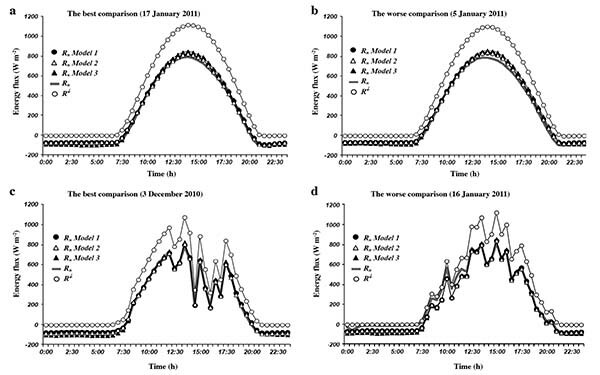 The comparisons between observed and estimated values of Rn on 30 min intervals and daily basis indicate that the points were close to the 1:1 line, but at 30 min time intervals the three models tended to overestimate and underestimate the observed Rn for values > 600 W m-2 and Rn < 200 W nr2, respectively (Figure 3a, 3c, and 3e). On daily intervals, the Models 1, 2, and 3 overestimated observed Rn for values between 17 and 20 MJ nr2 d-1 (Figure 3b, 3d, and 3f). Figure 3. Comparisons between estimated (Rne) and observed (Rn) net radiation at 30 min interval (a, c, and e) and daily basis (b, d, and f) using Model 1, 2, and 3 for validation season. The solid line represents the 1:1 line. The daytime variation of observed and estimated Rn for the best and worse comparisons is presented in Figure 4. For clear sky conditions, the best comparison was observed on DOY 17, which presented the maximum differences at noon, with values of -40, -37, and -66 W m-2 for the Models 1, 2, and 3, respectively. During night-time, maximum differences were 30, 26, and 37 W m-2 for Models 1, 2, and 3, respectively (Figure 4a). The worse performance on clear days were observed on DOY 5 where the maximum differences were -55, -54, and -82 W m-2 for Models 1, 2, and 3, respectively. During night-time, the Models 1, 2, and 3 presented maximum differences ranging between 30 and 40 W m-2 (Figure 4b). For cloudy days, the best comparison was observed in DOY 337 where the maximum differences between Rn and Rne during daytime were between -23 and -43 W m-2 while those during night-time were between 22 and 39 W m-2 for the three evaluated models (Figure 4c). For cloudy sky conditions, the worse comparison during the daytime was observed on DOY 16 where the maximum differences ranged between -103 and 102 W m-2 for the three models. During night-time, the Models 1, 2, and 3 presented maximum differences of 52, 51, and 77 W m-2, respectively (Figure 4d). Figure 4. The best (a and c) and worse (b and d) comparison between observed (Rn) and estimated (Rne) values of net radiation for the Models 1, 2, and 3 under clear and cloudy days for validation season. The incoming short wave radiation (R↓) is included as a reference. Results obtained in this research agree to those observed in the literature for grass, olive orchard, vineyards. For a drip-irrigated 'Cabernet Sauvignon' vineyard (fc = 0.30), Carrasco and Ortega-Farías (2008) indicated that Equation  (Table 3) underestimated the observed values of Rn at 30 min time interval with an error and RMSE of 6% and 45 W m-2, respectively. On daily basis, Equation  underestimates the Rn with an error of 5% and a RMSE of 1.21 MJ m-2 d-1. For a drip-irrigated 'Merlot' vineyard (fc = 0.30), Ortega-Farías et al. (2010) found that Equation  underestimated the observed values of daily Rn with an error equal to 6% and a RMSE of 1.3 MJ m-2 d-1. For olive orchards, Berni et al. (2009) reported a good fit between Rne and Rn with a RMSE equal to 23 W m-2 (Equation ) for clear sky condition. Kjaersgaard et al. (2009) tested an Rn-model (Equation ) on a field covered with green grass (Denmark) observing a RMSE and MAE of 1.47 and 1.22 MJ m-2 d-1, respectively. For grass at reference condition, Ortega-Farías et al. (2000) observed that Equation  simulated the hourly Rn for Avignon (France) and in Talca (Chile) with a RMSE of 34 and 42 W m-2, respectively. For a turfgrass field, Sentelhas and Gillespie (2008) in Canada (Eloria, Ontario) used an empirical Rn-model (Equation ), parameterized by Iziomon et al. (2000), obtaining a MAE of about 28 W m-2. In summary, the validation of the three approaches indicated that the ranges of statistical parameters are similar to those found in other model validations (Table 3). Table 3. Examples of several empirical and semi-empirical methods used to estimate the net radiation (Rn) for different type of vegetation. R1 and Rl1: incoming short and long wave radiation; RJ: outgoing long wave radiation; R outgoing net long wave radiation; R1 clear-sky: clear-sky short wave radiation. In general, the three evaluated approaches presented a good performance to estimate Rn for the different assumptions showed here. It is important to acknowledge that the parameterization of Rn, depend on the training system, canopy architecture, plant density and fractional cover (Ortega-Farías et al., 2010). In this study, a constant shape of the canopy was maintained with fc ranging between 0.29-0.30 during the two growing seasons (calibration and validation model). Under this constant shape, the daily ratios of R↑ to R↓ were quite constant (α = 0.17 ± 0.015), allowing a good performance of the Models 1, 2, and 3 during the two study periods. At 30 min intervals, the model validation using Φ = 1.75 and albedo = 0.17 indicated that the three approaches were able to simulate the net radiation (Rn) over a drip-irrigated olive orchard with a root mean square error (RMSE) and mean absolute error (MAE) lower than 39 and 31 W m-2, respectively. On a daily basis, the three models presented a RMSE < 1.54 MJ m-2 d-1 and MAE < 1.35 MJ m-2 d-1. Furthermore, the three semi-empirical models showed errors lower than 6% and 3% for a 30 min and daily time intervals, respectively. The Model 2 and 3 estimated better the observed values of Rn because they showed lower values of t-statistic, and a good performance of the refined index of agreement (dr) for a daily basis and at 30 min intervals. However, the three Rn-Models presented here would be evaluated and used in others Mediterranean conditions depending of the availability of data. Future research will be centered on the effect of the training system on the parameterization of Rn. Also, we will explore the application of remote sensing to simulate the ground surface area cover which depends on olive tree vigor and canopy geometry. The research leading of this research was supported by The Chilean Government through the projects of Comision Nacional de Riego (CNR), FONDEF (nr D10I1157), FONDECYT nr 1100714 and Universidad de Talca through the research program "Adaptation of Agriculture to Climate Change (A2C2)". CIREN. 1997. Estudio agrologico, VII Region. Descripciones de suelos. Materiales y simbolos. Publicacion N° 117. 659 p. Centro de Informacion de Recursos Naturales (CIREN), Santiago, Chile. Morales, S.L. 1997. Evaluacion y zonificacion de riesgo de heladas mediante modelizacion topoclimatica. 143 p. Tesis Doctoral Ciencias Ambientales. Universidad de Concepción, Concepción, Chile.